A world famous Hindu temple of India. This is the most visited abode of Lord Krishna in Kerala. Legend is that Lord Krishna, before his Swargarohana, entrusted an idol of Lord Vishnu to Sri Udhava, his child-hood friend and companion, to get it consecrated at a suitable place. The idol was worshiped by Lord Krishna�s parents Vasudeva and Devaki at Dwaraka. Lord Krishna directed Sri.Udhava to seek the help of Brihaspathi (the Guru of Devas) and Vayu (the wind-god) in finding a suitable place. Accordingly, Sri.Udhava met Guru and Vayu. Vayu took the idol on its fold and along with Guru they went out in search for a suitable place. On reaching the present day Guruvayur, they witnessed a divine scene. Lord Shiva and Goddess Parvati were dancing by the side of a lake! (the present temple tank). Guru Brihaspati requested Vayu Deva to land on earth. He selected the spot for the consecration of the Lord Krishna. So, with the permission of Lord Shiva, they consecrated the idol at that spot- that is the present day Guruvayur. Meanwhile, Lord Shiva agreed to move to another place called Mammiyoor, which is nearby. Since the idol was consecrated by Guru and Vayu, the Lord came to be known as ‘Guruvayurappan’ and the place became Guruvayur. Tradition holds that Janamaejaya of Mahabharata came here to worship Lord Guruvayurappan here and got his leprosy cured. The present structure dates back to 1970. There was a major fire at the temple in that year. The early history of the temple is vague. The temple came to prominence when the Zamorin (the King of Calicut) got hold of the temple. Later, the Dutch followed by Hyder Ali of Mysore, had attacked the temple and looted its wealth. But the attack of Tipu Sultan of Mysore was massive. The idol had to be shifted to Ambalapuzha Sree Krishna temple. 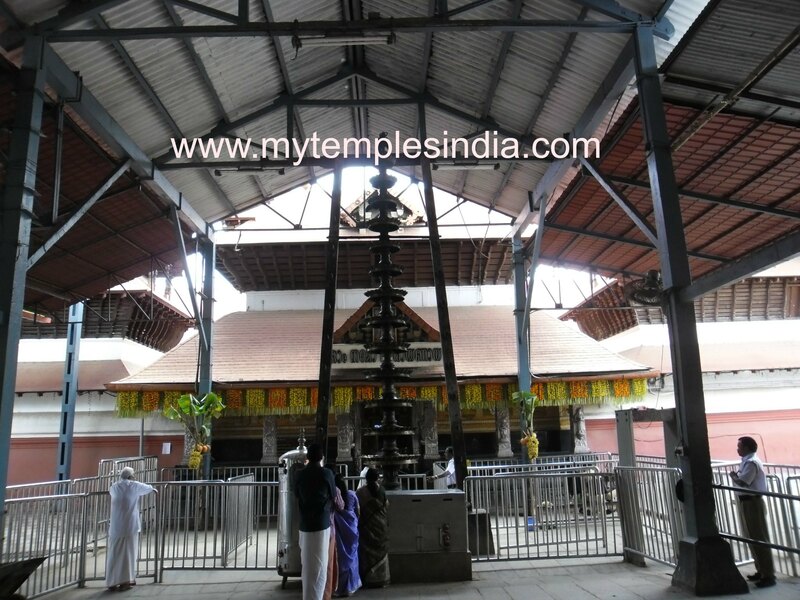 The worship was carried out at Ambalapuzha temple for about 12 years before its return to the present temple. �Narayaneeyam�- the famous Sanskrit poem of Melpathur Narayana Bhattatiripadu, depicting the life of Lord Sri Krishna was written at this temple. It is believed, Sri Melpathur got relieved of his arthritis with the blessings of Lord Guruvayurappa on the completion of writing this poem. Guruvayur is about 30 kilometers from Trissur. A small-township is there around the temple to cater to the needs of ever-growing number of devotees that visit this temple. � 2010-2016 My Temples India. All rights reserved.